Coins are a principal source to elucidate both the pattern of trade between Sri Lanka and the western world in late antiquity and the island’s monetary and economic history. 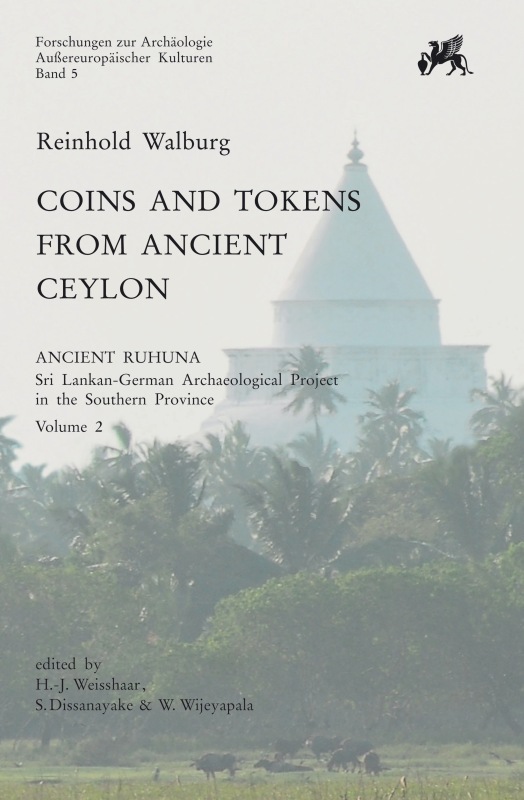 The study first and foremost critically compiles and annotates the finds of Late Roman, ancient Indian and local coins discovered in Sri Lanka. Coins are our principal source to elucidate both the pattern of trade between Sri Lanka and the western world in late antiquity and the island’s monetary and economic history of this period. Of the specimens discovered in Sri Lankan soil only two sorts were of significance: Indian silver punch-marked coins and their imitations were used as an all purpose money or general currency, whereas Late Roman “chicken feed copper” coins and their imitations functioned as special purpose money for essentially monastic purposes. The study first and foremost critically compiles, annotates and publishes – partly for the first time – the finds of Late Roman coins, ancient Indian and local coins and coin-like objects discovered in Sri Lanka from 1584 to 2005. This compilation is supplemented by a list of hoards of mediaeval Sinhalese and Chinese hoards and rounded off by a digest of findings of Late Roman coins in India. In: Orientalistische Literaturzeitung 2017; 122(2): 177-183. In: Klio. 92 (2010) 2. S. 555-556. In: Marburger Beiträge zur antiken Handels-, Wirtschafts- und Sozialgeschichte. 27 (2009). S. 200-206.
they have cooperated with a wide range of scholars who took up the task of identifying and interpreting the various findings, explain their significance and assess their historical value. Reinhold Walburg, an acknowledged expert of Roman coinage , has been put in charge of the coins that have come to light in recent years. Drawing on his own substantial researches in this field, Walburg has compared the recent findings from the South of the island with those found in the rest of the island, and thus combined the cataloguing of the ancient coins with an analysis of their wider implications. See Hans-Joachim Weisshaar et al. (eds. ), Ancient Ruhuna. Sri Lanka-German Archaeological Project in the Southern Province, vol. 1, Mainz 2001. Reinhold Walburg, Antike Münzen aus Ceylon. Die Bedeutung römischer Münzen und ihrer Nachahmungen für den Geldumlauf auf Ceylon, in: Studien zu Fundmünzen der Antike, 3 (1985), pp. 27-260. „Il volume vuole presentare in modo criticamente affidabile il catalogo dei ritrovamenti monetali, pubblicati e inediti, delle monete romane e delle altre monete antiche dello Sri Lanca. Il materiale così reso noto, costituisce una affidabile base per gli studi aventi come argomento il commercio dell'Impero romano con l'Oriente e le interrelazioni tra l'India peninsulare e lo Sri Lanca. Il volume offre inizialmente la storia della collezione del Museo Nazionale di Colombo e del Dipartimento di Archeologia e ripercorre le prime ricerche condotte soprattutto da J. Still e H. W. Codrington. Passa in rassegna i principali scavi che hanno restituito monete e il materiale disponibile: monete Indiane contromarcate, monete romane e di altri paesi occidentali, imitazioni locali, token e monete/oggetto. Segue poi il catalogo (pp. 115-285) con 343 ritrovamenti costituiti da monete singole e ripostigli. Vengono poi discussi i ripostigli fornendo una serie di considerazioni sulla storia monetaria ed economica del paese con particolare rilievo al commercio tra Sri Lanca, India e i paesi del mondo occidentale dal quarto al settimo secolo e come la moneta romana arrivò nello Sri Lanca. In: Societa’ Numismatica Italiana. Comunicazione. 22 (2009) N. 60. S.18.